White flowers that break open from apple pink buds make Clematis armandii ‘Apple Blossom’ a must have climbing plant. This is a fairly vigorous plant evergreen climbing plant so give it room to grow and something to climb on. Left to its own devices it can reach 8 to 10 metres in height. We think it is better kept to around 2 metres so that the fragrant flowers can be appreciated. 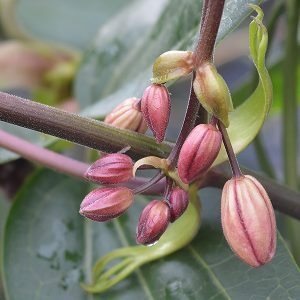 The flower buds will appear in late winter to spring, flowering period is from spring to summer, however repeat flushed of flowers will appear right through until mid summer. Foliage is a mid to deep green, with new growth having a bronze to coppery tinge. The mulch helps keep the root system moist and cool, and if you can keep the root system in part shade, this is even better. 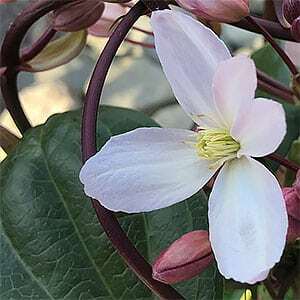 The best time too fertilise Clematis armandii ‘ Apple Blossom’ is directly after flowering. As tempting as it may be to let this fast growing climber have it head, pruning from an early age is recommended. The flowers appear on last seasons growth, so pruning after flowering each year, while the plant is still putting on new growth is recommended. Dead wood can be pruned away at the same time. This practice will also keep the plant more compact, and the flowers as a level where you can appreciate them.